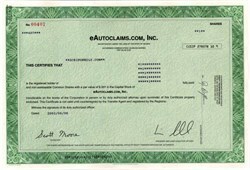 Beautifully engraved certificate from eAutoclaims.com . This historic document was printed by the Canadian Banknote Company and has an ornate border around it. This item has the printed signatures of the Company's President ( Eric Seidel ) and Secretary ( Scott Moore ). eAutoclaims is a business services company that provides the insurance industry with claims management services through both ASP and integrated outsourcing solutions. The Company's clients are insurance companies, fleet management companies and insurance services companies. eAutoclaims' solutions streamline the claims handling process, decreasing the overall time and cost required to process a collision claim and reducing average paid losses for its clients. The Company handles repair estimates, repair audits and claims systems administration services for automobile claims that are processed and tracked via the eAutoclaims Web-based platform and network of service providers.